I had the opportunity to work with the lovely Danielle and charming Bre, of Etsy Labs on a knitting how-to video. They were just wonderful in helping me do my first video. It's currently up in the Storque if you'd like to check it out! 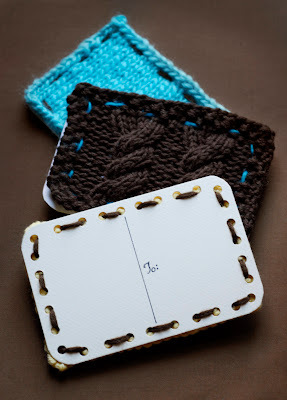 The project for my video is a simpler version of my cable knit postcard that I had done earlier this year. Click here for that pattern. It's meant to be a creative chain mail - you knit a postcard, tag your friend, they make a postcard and tag someone, and so on and so forth. It's supposed to keep the creative flow going.